The Girls are having an evening of art, music, and fun to celebrate a decade of crafting metal and making flames! Featuring a gallery show, signing of our brand new 2011-2012 calendar, and the excellent musical syncopations of Ambient Mafia and the Space Cowboys. Best of all – the evening is open to one and all, with no cover charge! Yes, that’s right. It’s absolutely FREE, and we want YOU to come. The people who brought you Serpent Mother, Mutopia, Hand of God, Soma, and many other breathtaking works, invite you to join them for a gallery show to mark the release of their new two-year calendar. 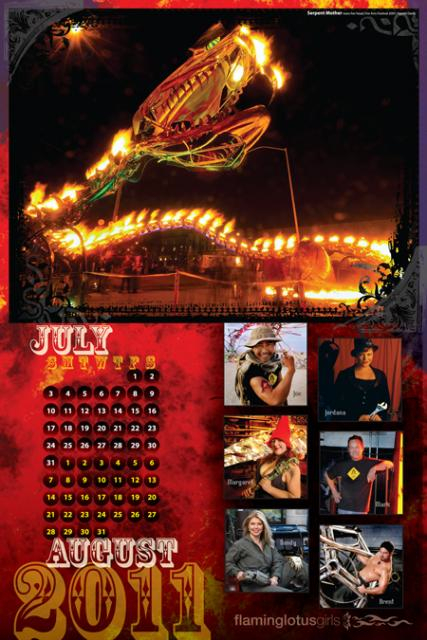 Showcasing the sexiest metalwork and metalworkers on the planet, the Flaming Lotus Girls’ 2011–2012 calendar is, without a doubt, the most scintillating way to burn up the next 730 days of your life. Every calendar purchase supports the creation of stunning fire art and helps this female-driven group continue their tradition of innovation and inclusiveness. Whether it’s a gift for someone you love – or for yourself – be sure to pick one up and keep the Flaming Lotus Girls ignited! Support your local woman-centered pyrotechnic art collective and have a fancy time as well!